While Preity Zinta has been away from Bollywood movies, she certainly stays in the limelight even now. Co-owner of one of the IPL teams, she is quite passionate about cricket. Though, amidst the events at IPL 2018, Preity has also fueled tons of controversies. From her reaction to Mumbai Indian’s loss to an overwhelming purchase at the IPL auction, she has been in the news for tons of reasons. We have come up with details about all the controversies related to Preity Zinta IPL 2018. Before we proceed, it is important to note how Preity Zinta is related to IPL. You might already know her as an award-winning actress famous for movies like Kal Ho Na Ho, Soldier, Kya Kehna, Kabhi Alvida Na Kehna, and more. Though, Preity’s love for cricket is also quite evident as she is the co-owner of Kings XI Punjab. It is a franchise in Indian Premier League, which is jointly owned by Preity Zinta, Ness Wadia (of Wadia Group), Dabur Group. The team’s home ground is in Mohali, Punjab. 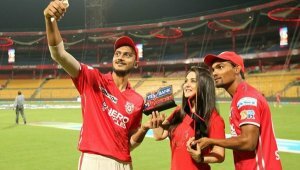 Kings XI Punjab has been active in IPL ever since its inception in 2008. Though, the team has never won the championship once. Here’s a quick look at their positions in all the IPL seasons. While every IPL auction is quite thrilling, this year’s event was certainly an exception. Initially, Zinta made headlines for her panic bidding at the IPL auctions. While she was surrounded by experts (like Virender Sehwag), Preity’s bidding didn’t seem strategized. She started making high bids for almost every player. Preity Zinta IPL auction certainly became memorable when she ended up buying 5 players in one go – including KL Rahul for 11 crore. Besides that, Preity Zinta IPL auction grab included Ravichandran Ashwin for 7.60 crore, Karun Nair for 5 crore, David Miller for 3 crore, Marcus Stonis for 6 crore, and Andrew Tye for 7 crore. These are only a handful of players that Zinta bought. All of this made Kings XI Punjab one of the most expensive teams in IPL history. We all saw Preity Zinta at IPL on numerous occasions. She was present at all the crucial matches of Kings XI Punjab. Unfortunately, the team was not able to perform well and got eliminated at the league stage. It has been speculated that Zinta and Sehwag ran into a heated argument after the team’s defeat against Rajasthan Royals. The team had to chase a target of 159 runs set by Rajasthan Royals. Sehwag changed the batting order that impacted team’s performance. It has been speculated that Zinta blamed Sehwag for the defeat, which gradually eliminated the team from the league. Though, Zinta later tweeted to clarify the issue, the damage was already done. Zinta got herself into another controversy related to IPL this year. Though, this time, it was not about her team. The last few league matches are quite crucial as they determine who would be eligible for the playoffs. In order to qualify, Mumbai Indians needed a big win over Delhi Daredevils. Though, when the team was defeated, they lost a chance to qualify. A video was circulated that captured Zinta’s reaction of MI’s loss. In the video, she was assumed as saying “I am just very happy that Mumbai Indians is knocked out. Really happy.” This got her an evident backlash from MI fans as they were not happy by her sportsmanship. Even after her clarification, fans thought that Preity Zinta IPL reaction was of bad taste. Nevertheless, neither Mumbai Indians nor Kings XI Punjab made the cut in the end. If you don’t want to miss out on all the latest news related to cricket or IPL, then you should certainly download Snaptube. It is a freely available app that is compatible with all the leading Android devices out there. The app has featured a wide range of video hosting and sharing platforms in one place. Therefore, you can simply find your favorite videos of all genres without switching between different apps. From cricket news to celebrity gossip, you can watch all kinds of videos on Snaptube for free.